I spent many years as a wrestling coach for a local club wrestling team. My focus was always on coaching personal responsibility, the importance of goal setting, and the need for principled discipline. 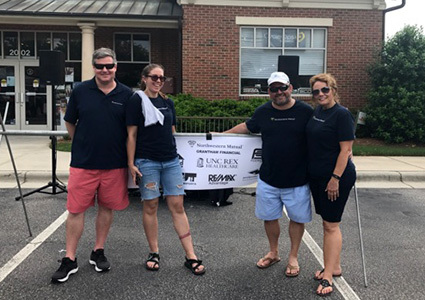 My team looks for ways to serve and support our community, from sponsoring events held by the Holt Brothers, to sustaining the educational programming at WUNC radio, to donating to and adopting from the local SPCA, in addition to many other events and programs. I am also a proud member of the Durham Sunrise Rotary Club. The Durham Sunrise Rotary, known in this area as "The Little Club that Can and Does", includes a diverse cross-section of Durhamites from a range of professional backgrounds. The club is nonpolitical, nonreligious, and open to all cultures, races, and creeds. The main objective of all Rotary clubs is service — in the community, in the workplace, and throughout the world. Rotarians develop community service projects that address critical issues, such as children at risk, poverty and hunger, the environment, illiteracy, and violence. They also support programs for youth, educational opportunities, international exchanges, and professional development opportunities. The Rotary motto is Service Above Self. The Durham Sunrise Rotary Club has an annual fundraiser for Backpack Buddies, a much-needed program which provides weekend meals for children who count on free breakfasts and lunches during the school week. We were grateful for the opportunity to work with them this year! Learn more about their cause and how to get involved on their website. We were a grateful sponsor for the Holt Brothers 5th Annual Playoff party on Sunday, January 21st. The Holt Brothers Foundation works to support kids who have a parent with cancer, and we are always honored to take part in helping their cause. Learn more about their mission and their projects on their website. We enjoyed volunteering for Habitat for Humanity, spending the day getting sweaty for a good cause! 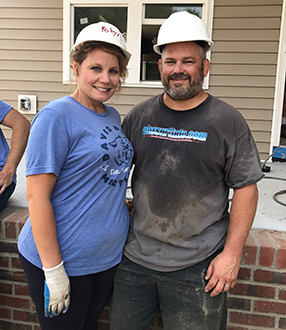 Learn more about Habitat for Humanity, and your opportunities to volunteer for this wonderful organization, by clicking here. The Red Ribbon Ride is a charity ride whose proceeds benefit the AASC, the Alliance of Aids Services Carolina. Since 1999, the Alliance has served the community by offering outreach programs, free testing, advocacy programs, faith ministries. and so much more. In an effort to raise funds which will support the continuation of these many programs and services, the Red Ribbon Ride was created. Red Ribbon Ride offers a raucous good time for a great cause, serving those in the Triangle and surrounding areas infected and affected with HIV and AIDS.This event offers 30, 62 and 100 mile routes, and Grantham Financial was proud to be at the finish line handing out burgers and beers to the many cyclists who donated their time and energy to a great cause.